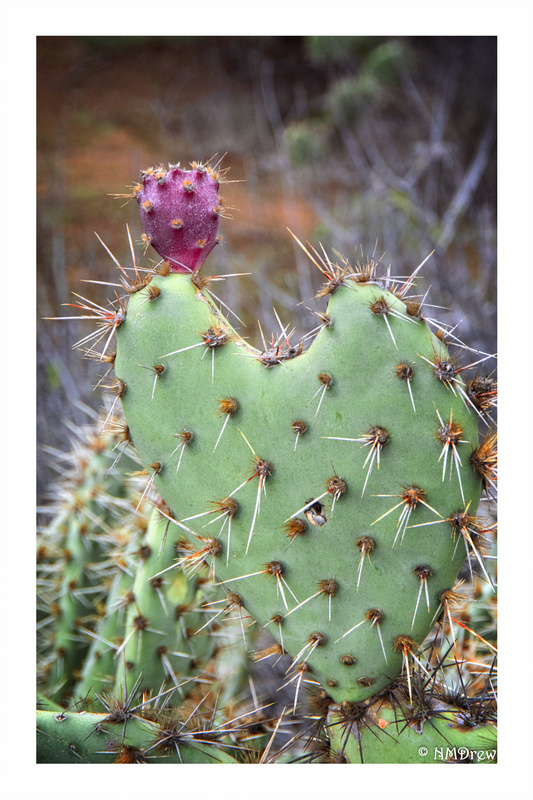 First, I really enjoy the prickly pear cacti in my neighborhood – that is, as long as I don’t fall into a patch. Their paddle-shaped stems (the thorns are the leaves) often show up heart-shaped, and in season bear beautiful flowers which become the pear. After all our rains, I can hardly wait to see what the trails nearby have to offer. Thoughts: Fraggie suggested a weekly post on the monthly subject. I will give it a shot for every Monday. That I think I can do without feeling depressed about my project and without feeling pressure from lack of time. My workday yesterday was out of the house at 8:00 a.m. and home at 7:30 p.m. I think you can see why time is not always available! This entry was posted in 365 project, Glimpses and tagged 1 Nikon 10-100mm f4.5-5.6, cactus, Nikon V3, photography, prickly pear. Bookmark the permalink. 🙂 They are a great shape, but ouchy! Ouchy, indeed! These are really obvious thorns – but others are really soft looking, and if you rub up against them, you are very unhappy. Thanks, Eduardo. If I were really hungry, I could eat the whole cactus! I’ve had nopales mixed in with scrambled eggs, and the pears, too. Tuna, eh? I like that word!